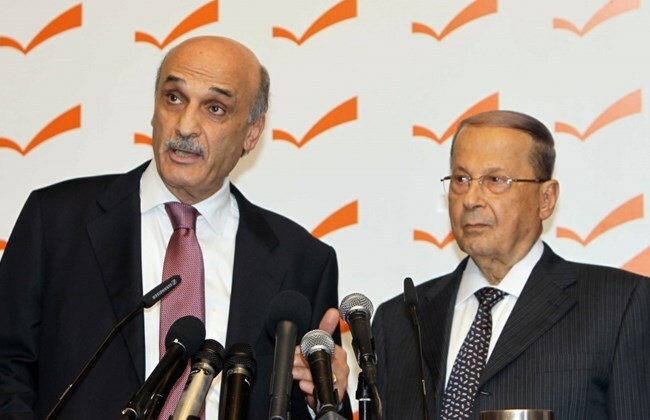 Aoun-Geagea: Is It Truly a Declaration of Intent? “A declaration of intent” (اعلان النوايا), they called it. Because you know, as the Lebanese say, “المهم النية”. Surprise. For the first time since 2005, Michel Aoun and Samir Geagea met. Live. Face to face. Without having to shoot at one another like the good old days of the late eighties. But if you have been following Lebanese politics for the past 9 months, the meeting between the leaders of the two main Christian parties shouldn’t be surprising. Both parties were having talks since Hezbollah and Mustaqbal started their dialogue earlier this year (Aoun even tasted Geagea’s truffles in January! ), the talks were making good progess in April, and the declaration of intent was actually finished a month ago. In fact, if you remember correctly, the fear of an FPM-LF rapprochement led the Kataeb, Michel Sleiman, and other minor Christian politicians to unite under one front in March. So no, it should not be that surprising to see Kanaan and Riachi telling us that the FPM and the LF are intending to continue the dialogue and work within the constitution in order to protect their interests. What is weird here is the timing of the declaration. When they finished it last month without directly announcing it, it was assumed that both parties were waiting for M8 and M14 to agree on the major issues such as the presidential elections. It’s still too soon to be sure why that specific timing was chosen, but it seems right now that Geagea was trying to sabotage a potential rumored Aoun-Hariri deal on the way: letting Aoun name the commander of the army in exchange of conceding to some of Mustaqbal’s terms such as M8 lifting its veto on some centrist presidential candidates. Only yesterday, I was talking about how important it is for Aoun and the FPM that Roukoz becomes commander of the army. If you read the declaration, you’ll find out that it revolves around one main idea: protecting the Christian interests, and at their core, the election of a strong president (look for the sentence in bold in the original text). And in case you still don’t know what a “strong president” means after 12 months of presidential vacancy, let me enlighten you: Strong = Aoun and /or Geagea. Aoun looked like the bigger party yesterday, since it was Geagea the one who visited him in Rabieh, but don’t be fooled by the formalities, since in the end, the leader of the Lebanese Forces succeeded in bringing back the “strong president” rhetoric to life, thus pushing Aoun away from the idea of a consensual president and a Roukouz deal with the Mustaqbal and the PSP. Yesterday, it wasn’t a new alliance between the LF and the FPM that was starting. It was the consensual candidate – Roukoz deal that was being put off the table, At least for now. ولما كان التيار الوطني الحر والقوات اللبنانية قد عقدا أكثر من لقاء وبحثا أسس التفاهم في ما بينهما، فوجدا أن التنافس السياسي أمر مشروع وواجب لارساء قواعد الديمقراطية وبلورتها في نظام للحكم. ولما كان حزبا التيار الوطني الحر والقوات اللبنانية قد أجريا مراجعة للعلاقة التي سادت بينهما خلال أكثر من ربع قرن وذلك من أجل تنقية الذاكرة من مناخات الخصومة السياسية التي طبعت تلك العلاقة، والتطلع بالتالي نحو مستقبل يسوده التنافس السياسي الشريف و/أو التعاون السياسي. – التأكيد على التمسك بالمبادئ الكيانية المؤسسة للوطن اللبناني والتي هي سبب وجوده وجوهر رسالته في التسامح والتنوع والتعايش الفريد القائم على المشاركة الكاملة في الحكم والعمل المشترك من اجل اقرار القوانين المحققة لذلك وفي طليعتها قانون استعادة الجنسية وقانون تملك الأجانب كما العمل من أجل الحؤول دون القيام بأي اجراءات تخالف المبادئ المنبثقة من الصيغة اللبنانية ومن الميثاق الوطني. وإذ يعتبر الطرفان أن اعلان النوايا هذا، يهدف إلى وضع المبادء الديمقراطية ومعاييرها كأساس لتنظيم علاقتهما، يؤكدان على ابقاء المبادئ الدستورية والميثاقية فوق سقف التنافس السياسي، كما يؤكدان على ارادتهما ورغبتهما بالعمل المشترك والتواصل في جميع المجالات والمواقع الممكنة لتنفيذ التزاماتهما المنوه عنها اعلاه ويعتزمان العمل على تفعيل انتاجية اتفاقاتهما حيث يتفقان، والتنافس من دون خصام حيث يختلفان، كما يتعهدان بالتواصل الدائم والتباحث المستمر للتفاهم على كافة المواضيع ذات الشأن العام والوطني. 375 days since the 25th of May. 211 days since the 5th of November.